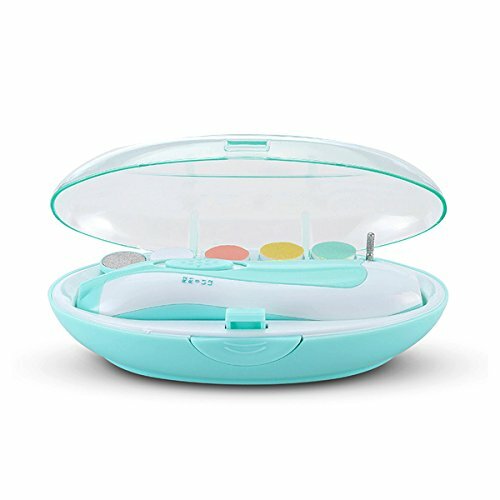 Electric Baby Nail Trimmer File with Light - Safe Nail Clippers Kit for Newborn Infant Toddler Women Adults Toes Fingernails Manicure Set - Care Polish and Trim Tools by Little Joy at Veteran Parenting. MPN: unknown. Hurry! Limited time offer. Offer valid only while supplies last. Have you ever been in the situation that when you cut your baby's nails and ended up cutting off skin, causing your little baby to burst into tears? Have you ever been in the situation that when you cut your baby's nails and ended up cutting off skin, causing your little baby to burst into tears? Have you ever expected this situation could be solved? - Nail clipper with light so you can trim your baby's nails while they are sleeping.Quiet operation won't create any noise that would disturb your baby. If baby's nails are too long, please cut a part of the nail before using the trimmer;Do NOT use adult-sized attachment for baby nail;Please keep your baby away from this electric trimmer kit to prevent accidental swallowing; AA BATTERIES NOT INCLUDED. QUIET OPERATIONS WITH LED FRONT LIGHT: Whisper-quiet operation boasting an LED front light and whisper-quiet motor and the LED lighter allows trimming babies nail in the dark when they are sleeping without causing any disturbance. 6 IN 1: Toddler nail clipper with light come with 3 cushioned grinding head tools for babies and children use, as well as 3 nail tools for adult use, 1 main unit of the nail file that includes the led electric light; 1 transparent case holder and 1 user manual, 2 AA batteries Not Included. ADJUSTABLE SPEED: There are Multiple settings so you are able to control speed (high/low) and rotation (clockwise/reverse) for enhancing nail filing positions and softer, smoother nails.ADJUSTABLE SPEED: There are multiple settings so you are able to control speed (high/low) and rotation (clockwise/reverse) for enhancing nail filing positions and softer, smoother nails.